IMAGE: Wales' Gareth Bale celebrates scoring their first goal. Photograph: Regis Duvignau Livepic TPX IMAGES OF THE DAY/Reuters. Wales were billed as a team dependent on Gareth Bale but a 2-1 win over Slovakia in their Euro 2016 opener on Saturday was built on a pacey, fearless performance that should help prove they are more than a one-man show. The Real Madrid forward opened the scoring after 10 minutes with a swerving free-kick that wrongfooted keeper Matus Kozacik but for much of the match he was isolated and had to track back rather than being able to spark another moment of magic. It begged the question of whether Chris Coleman's unheralded squad, which includes a raft of lower league players, could rise to the occasion after a poor run of form in warm-up games when Bale barely played and the squad's depth was shown wanting. Operating just behind the main striker, the world record 85 million pounds ($121.21 million) forward scored seven of the 11 goals that enabled Wales to finish runners-up to Belgium in their qualifying section. But against Slovakia, in a tricky Group B that also includes England and Russia, Coleman opted to make him the lone focal point with Aaron Ramsey and the little-known Jonny Williams interchanging runs from deep in midfield to back up Bale. Wing-backs Chris Gunter and Neil Taylor pushed up, squeezing the Slovakia defence. Wales' two holding midfielders -- Joe Allen and David Edwards -- mopped up and gnawed incessantly at Slovak ankles to nullify their momentum going forward. 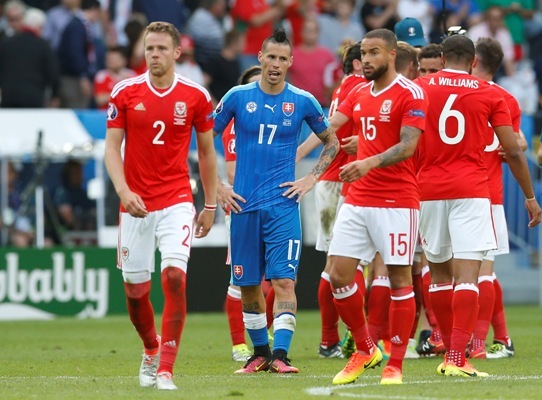 IMAGE: Slovakia's Marek Hamsik looks dejected at the end of the match as Wales' Chris Gunter(left), Jazz Richards (second right) and Ashley Williams celebrate. Photograph: Albert Gea Livepic/Reuters. Slovakia captain Martin Skrtel highlighted his team's irritation with a series of ugly challenges that could have seen him red-carded. After 55 minutes he threw his hands in the air calling on his players to show themselves for him. It could have been different though. Slovakia's talisman Marek Hamsik glided and feigned his way through Wales' defence after five minutes. With the playmaker looking certain to score, defender Ben Davies set the tone for the Welsh team ethic by scurrying back to clear off the line. After that Hamsik increasingly dropped back to try to get the ball, leaving striker Michal Duris chasing shadows until he was taken off just after the hour. It was then that the Welsh resilience was really tested. Slovakia coach Jan Kozak shuffled his midfield, taking off holding midfielder Patrick Hrosovsky for the more attack-minded Ondrej Duda. IMAGE: Wales' Chris Gunter, Gareth Bale and Joe Ledley celebrate after the match. Photograph: Regis Duvignau Livepic/Reuters. Wingers Vladimir Weiss and Robert Mak, anonymous for the first hour, finally pressed higher up the pitch, and the Wales midfield, so dominant earlier, appeared laboured and tired. Within seconds of Duda coming on Mak played him in to level the score. The Slovaks were in the ascendancy and Coleman needed his team to dig deep. With Bale and Ramsey looking exhausted, the Wales coach opted to throw on an extra forward, Hal Robson-Kanu, as well as midfielder Joe Ledley, who just over a month ago broke his leg. Within minutes, a move that started with Ledley ended with Robson-Kanu putting the ball into the net with 10 minutes to go. The Welsh held on and showed that even with an average Bale, they may just have enough in their arsenal to dream of their first quarter-final at an international tournament since 1958.